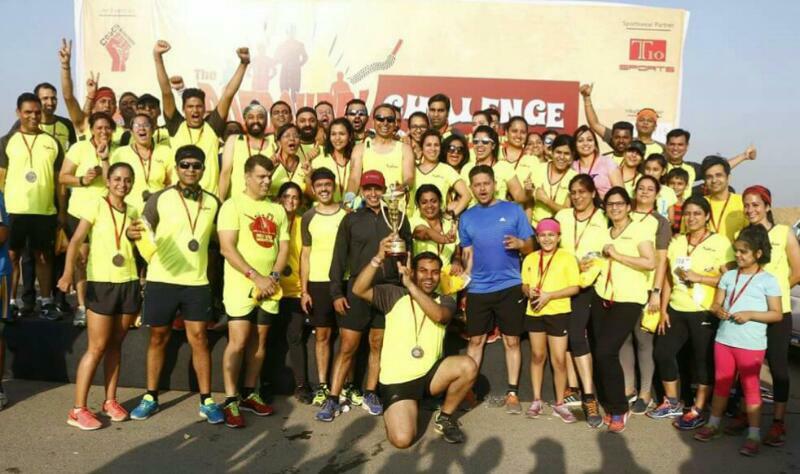 The Potpourri Challenge 2107 – intriguing name for the third edition of the annual Run-fiesta at NCR. An event which was brilliantly conceived and executed to perfection by Coach Ravinder ! Before you ask….I’ll come to the metaphor at the end. A competition or challenge of sorts between the Running groups of NCR. 1 Mile, 5k and 10k races. Every participant gets the Group a point while absentees fetch minus three. Bonus marks for top three runners in each age and gender category. Chip timing to ensure fairness. Simple and yet absolutely brilliant! No entry fee…medals, tee shirts, hydration, breakfast for all… a true Run Fiesta ! The purpose – to promote healthy bonding between runners and motivate newbies to take up running. I think it did that and much more! The last month saw feverish activity in the groups to get max participation…including head-hunting for speed guns…and getting out of town types to come and take part. I did spot two who came from remote areas of Kashmir just for group loyalty (kudos). Next came strategizing…assessing the other groups and putting your runners in races with the best chance of winning…of course this was an ultra secret activity – not to be revealed to the other groups under any circumstances ! This was followed by focused race based training and the final speed test a week before the big day. And lastly motivating, cajoling, threatening and finally begging so that nobody missed and got the Group negative marks. 02 April 17, 0500 h onwards – 1000+ Runners from all corners of Delhi congregated at a lonely patch of road in Dwarka. The atmosphere was electric – last minute bib distribution…confusion in the dark…music…group wise warm-up…lots of runner bonding…Hi’s, high fives, hugs and ‘Hey, long time no see’ and the mandatory pre-race selfies and photo-sessions. Runners fashion parade ! The super fit and good looking Adidas brand ambassadors added to the glamour. The sun peeped out and suddenly it was time for the races to begin. 1 Mile. The sprinters and a lot of newbies (especially kids) shot off from the starting mat to put themselves under five to ten minutes of self-inflicted burning lungs and torture ! A few minutes of pain later…the finish line and the cheering crowd were in sight. Maximum cheers and claps for the speedsters (whom I hold in awe) and shouts of encouragement for the kids and newbies….Welcome to the Passion of Running ! 5K. This one had the maximum participation. Somehow…just somehow….almost every NCR runner (including me) who has a respectable half-marathon time opted for this one …Wonder why ? Result – a mad rush at the start and intense duels during the run ! A hard 5k is a speedy, selfish and strictly no talking run. I refused to pace my running buddies – so here are my apologies in public (will more than make-up) ! A fast start, laser focus with barely a smile to acknowledge fellow runners and the constant effort to cross just one more runner in front of you…runners dueling at its best. Close to the finish…the running form vanishes, lungs burn and the last final push to cross the finish line ! 10K. My heart goes out to the brave ones who ran the 10k. Firstly, it started just before the 5K. The speedy 5k runners passing the 10k types messed up quite a few pacing plans and demoralized some. Secondly, they had to do two rounds of the 5k route…not a very happy situation to see runners finishing while you are done only with half the route! It took great stamina, mental strength and determination to finish strong. RESPECT. The finish line crossed….heavy breathing and racing heartbeats return to normal…you check your Garmin…a PB ! Over the moon with joy ! The newbies are elated at their achievement and some are disappointed with their performance Next you look for your running buddies and your group – cheering them and asking them : How was it ? ‘Wow’, ‘Supershow’, ‘Killer Run Champ’ ensue ! Medals and Tee-shirt collected. The second round of selfies, group photos and runner bonding and socializing starts. The hearty breakfast provided by the Coach tastes wonderful. Groups and friends huddled together wait for results – both individual and for the groups. Cheers and shouts from different corners tell the obvious. A second round of congratulations begins. Meanwhile an intrepid lot managed to sneak in a chilled beer or two ! I wish these group events happened more often ! Potpourri Challenge 2017 – gave us a goal as part of the Running Group community. We put in the hard work and the perseverance. The results spoke for themselves. It strengthened the Runners’ Bond – a shared passion for fitness and constant improvement. It made the newbies try out something new and hopefully ignited a spark in them. The question is – isn’t life the same…seeking constant improvement, trying out new things, making and strengthening relationships, a sense of belonging, setting goals, achieving success and learning from failure to shine again ?